Comeback for the QE2 and record UK market figures. Cunard’s Queen Mary is still with us after some initial problems at its Long Beach home, and now its successor as the pride of the fleet, QE2, has overcome early difficulties as a floating experience and is open for the public quayside at Dubai. The world-famous cruise liner, which has a history spanning five decades, is now docked permanently at the Mina Rashid cruise terminal, where her dining, accommodation and entertainment attractions are being developed with a “Grand Opening” planned for October. In this first phase, she is welcoming passengers on board to experience a selection of beautifully restored rooms and suites, to discover five of the planned 13 restaurants and bars and explore her rich history in the adjacent QE2 Heritage Exhibition. 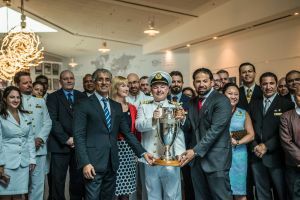 The Clydebank-built ship has launched a selection of special summer offers and experiences designed for residents of the Gulf Cooperation Council (GCC). From half price rooms for families and water park experiences to floating shisha tents and inclusive meals, visitors can experience a night’s stay from Dh499 ($135.8) for two people with the option of a room upgrade, breakfast and lunch or dinner in the Lido restaurant or the Queen’s Grill restaurant and complimentary tickets to Laguna Water Park at La Mer and a late check-out. Whether staying on board or just visiting for the day, passengers can relax in Dubai’s only floating shisha lounge. Open from 15:00–01:00 daily, Shisha at the Pavilion says it is the perfect venue to enjoy late night dining, a wide selection of beverages and a variety of shisha flavours – including a blend mixed exclusively for the QE2. 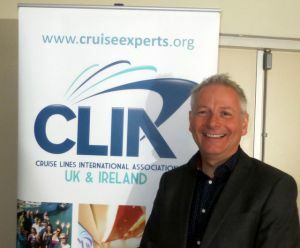 The British cruise market saw another year of growth in 2017 with a record high of 1,971,000 cruise passengers setting sail on an ocean cruise, representing an increase of 4.3%, against 2016, according to Cruise Lines International Association (CLIA) UK and Ireland. Details have been published in a 16-page review now available. Cruising held its share of the overall holiday market in 2017 at a little over 4%, and just under 11% of overseas package holidays, as compared to 2016.
industry. This is a strong performance from the UK and Ireland market and indicates that it’s highly likely the total for 2018 will surpass two million for the first time. never been a better time to take a cruise, thanks to a wider choice of ships, itinerary and style of cruise than ever before, and an unprecedented number of ships on the global order book. The overall value of a cruise holiday became a more important factor to consumers in 2017, with price, value for money, and special offers cited as key drivers of choice. Specifically, the inclusive drinks package became a more significant factor driving choice over the past two years. Between 2007 and 2013, lead times were generally declining but since 2013 lead times have steadily grown, with an average now of seven months, the longest since 2009. The Mediterranean remains the most popular cruise destination for the UK and Ireland, accounting for 37% of the market. It cemented its number one spot further in 2017 with growth of more than 12% against 2016. The second and third most popular destinations were Northern Europe and the Caribbean respectively, and both saw increases of more than 10%. Alaska came in fourth and saw growth of just under 9% in 2017. The 50+ age group of cruise customers are not only cruising more than last year, they’re also setting sail in increasingly adventurous destinations. 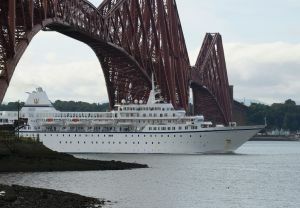 They are cruising in increasing numbers to long-haul destinations, such as Asia and China which saw a 40% increase in bookings from those in their 60s for example. The over-50s are leading the way when it comes to going on exploration cruises to largely unexplored parts of the world including the Galapagos, and the Polar regions, with bookings up more than one-third for cruisers in their 60s and 70s. However, it’s interesting to note where the growth is coming from for younger cruise passengers. Both Northern Europe and the Caribbean saw double-digit growth from cruisers in their 40s last year, indicating that this age group prefers to use a cruise to explore places they might not have been to before, rather than the more familiar Mediterranean region. This trend is also reflected by patterns seen for younger cruisers in their 20s and 30s who ditched the more popular Mediterranean coasts, for a change. With its easy access via the M25 and the QE Bridge Port of London Tilbury is steadily building up its visits from what these days are considered smaller cruise ships. 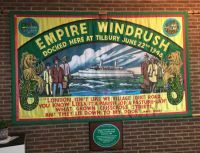 The well restored historic Grade II listed terminal is where the Empire Windrush docked on 22 June 1948 and “Ten Pound Poms” departed for a new life “down under” in the 1950s. It has a nostalgic feeling about it, and it works very well with only a single ship in at any time. If you have time to spare before boarding an informal exhibition tells the history of the Tilbury docks. Yesterday (Sunday 5 August) Voyages of Antiquity Aegean Odyssey, having just completed a circumnavigation of the British Isles, was a visitor to Tilbury her ‘home port’ for a series of ex UK cruises. She is now continuing on a Iceland, Faroes, and Shetlands trip, and departs 20 August on a voyage her up the Seine to Rouen, to Bordeaux, Oporto and finally Lisbon. BTN joined for what the travel trade calls “An inspection”. Based in Oxford (ABTA bonded) Voyages of Antiquity is Britain’s smallest deep-sea cruise line established in 2009. It has just a single ship Aegean Odyssey. Asked by BTN, Michelle Daniels, head of commercial, confirmed that business was good. “We are fast selling out of this year’s accommodation”, she said. Next had to be a question about expansion. She was not reticent: “If a suitable ship came along Voyages of Antiquity would look at it”. With just 380 passengers, land tours as part of your package, and a full lecture programme, Odyssey mirrored Swann Hellenic’s very popular Minera in what is a market for discerning clientele wanting to learn about the places visited. 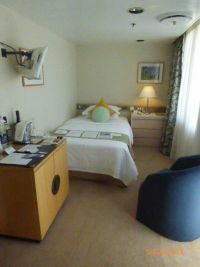 Minerva’s owner All Leisure Holidays went into administration in January 2017. Voyages of Antiquity has benefited. About 60% of clients are British we were told. Aegean Odyssey is not 5-star but seems to offer everything that its customers demand. Wi-fi is a requirement these days and this is available in certain areas. The cabin doors are opened by digital cards. All the accommodation we visited lived up to its brochure promises with perhaps the only recommendation BTN would make is an update of the TVs. Bigger screens please by the time Business Travel News joins the ship next spring on what will be the first important cruise liner to visit the Black Sea and Odessa for a number of years. We will offer a full report at that time. Children are not encouraged and the ship’s layout does not facilitate wheelchair use. There are 39 single cabins, and 42 with balconies. Dining in the two restaurants is very much open seating from 18:30 until 21:00. Dating back to 1973 (built for the Israeli company Zim) Aegean Odyssey is one of the oldest (quality) cruise ships around only predated by CMV’s classic Marco Polo which BTN will join in a couple of weeks’ time to Northern Norway, Archangel and Murmansk. (See next month’s cruising issue). A few hours ‘inspection’ on any ship will only highlight the good points but we were impressed. Odyssey’s hull looked smart with no rust (often a giveaway) and on boarding there were red carnations for all passengers and a bottle of Champagne or wine plus petit fours were in every cabin. The décor was bright and modern looking with no giveaway on age. Lunch of course on the first day. A major refurbishment of the ship -- from cabins and public rooms to the galley and funnel -- cost three times more than the purchase price of the ship, according to director, David Yellow. Aegean Odyssey's capacity was lowered from 570 to 378 by creating larger cabins via the combination of smaller cabins. An additional reconfiguration in early 2013 created 18 additional outside cabins by relocating the spa to replace 10 inside cabins. There is plenty of teak deck space for sitting out in the sun on sea days, and a seawater pool. We are looking forward to next Spring.